The Roman Finds Group (RFG) provides a forum for all those with an interest in Roman artefacts. The Roman Finds Group (RFG) provides a forum for all those with an interest in Roman artefacts. Founded in 1987, our membership is both professional and amateur, and new members are always welcome. Meetings are held twice a year across the country, with invited speakers presenting papers on a particular theme, site, exhibition, or region, and occasional short contributions from members on newly discovered artefacts. Recent themes have included surveys of artefacts from cemeteries, an examination of the opportunities and problems provided by waterlogged finds, and a review of the evidence for craft and industry in Roman Britain. Regional reviews have taken place in the areas of Hadrian's Wall, South Wales and the South-West of England. The aim of our meetings is to provide members with access to current research in advance of publication. From time to time joint meetings are held with museums or other special interest organisations, such as the Finds Research Group, and the United Kingdom Institute for Conservation. RFG members also receive our Datasheets, which so far include: Engraved Gemstones: A Guide for the Small Finds Specialist by Dr Martin Henig, Jet, Shale and Other Allied Materials by Lindsay Allason-Jones, Roman Beads by Barbara Birley, Roman Seal Boxes by Colin Andrews, The Wirral Brooch: A Regional Romano-British Brooch Type by Frances McIntosh,and Pipeclay Figurines by Matthew Fittock. With several more (eg pipeclay figurines, latch lifters) in the pipeline, we see the Datasheets as a collectable series; please contact our Publications Co-ordinator Gill Dunn (see 'RFG Committee' page) if you would like to contribute a future Datasheet. Datasheets are available for members to download through the Members' page. Do let us know what you think about this website, and please submit details of forthcoming events or news that may interest our members, to Nicola Hembrey (see 'RFG Committee' page). If you would like to join RFG, please click here. PinCopper-alloy pin from a deposit dated AD65-70 at Piddington Roman Villa, Northants. Pins in the form of a human hand holding an apple or pomegranate are believed to be fertility charms or tokens of love, and occur throughout the Empire. 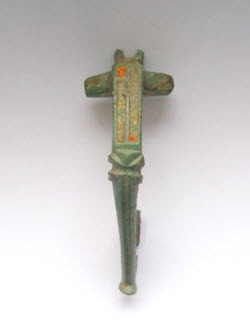 An enamelled 'developed' T-shaped copper alloy brooch dating to the first/second century AD.An enamelled 'developed' T-shaped copper alloy brooch dating to the first/second century AD. This one was found during excavations in Grosvenor Park in Chester, although this type is not usually found in northern Britain. 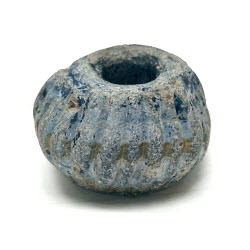 Blue glass melon bead of the first/second century AD. Recovered during excavations at the amphitheatre in Chester. Roman Finds Group members also receive Lucerna. Lucerna, the RFG newsletter, is published in hard copy twice a year, and contains articles introducing the literature on particular types of finds, as well as short notices of individual interesting objects in advance of publication. Book and conference reviews are also included, together with notices of meetings and conferences that may be of interest. The newsletter also provides a forum in which members can appeal for help with puzzling artefacts. Contributions are always welcome; please contact our Newsletter Editor Matt Fittock (see 'RFG Committee' page). The full archive of Lucernae can also be found on our Lucerna page, with editions from the most recent two years available to RFG members. We have designed a small PDF poster for Roman Finds Group which we encourage you to download and pin up to promote RFG to a wider audience. Thank you!